When running on the iPhone, UnityGUI ScrollViews act as if the player is using a mouse. The player can tap on or drag the scrollbar, but they can’t drag the list itself up and down with their finger. 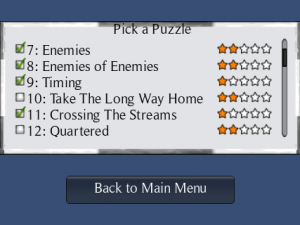 And naturally, that’s the first thing my playtester tried to do. 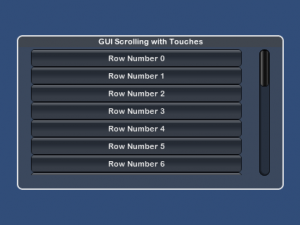 So it would be useful to be able to add touch behavior to UnityGUI scrolling lists. Here’s how I did it. This article may be useful to someone porting UnityGUI code to the iPhone, or who just wants a working example of how to use the different iPhone touch phases. Note that when a touch begins, we don’t yet know whether the player is starting a tap or a drag. And if they drag a short distance and then let go, did they tap that row or not? To avoid ambiguity many apps have the user press a “Done” button to confirm their selection. Other possibilities are to require a double-tap on a row, or treat it as a tap only if it is released quickly. I decided to copy behavior I liked in Things for iPhone, which highlights the row when it is first touched. But if the user starts to drag it, the highlight disappears. So a tap can be slow as long as the finger doesn’t move. I like this because you can see what you’ve selected, and cancel it (with a short drag) if you missed your target. The code for dragging the list turns out to be easy. All we need to do is detect when a touch delta has occurred. We then adjust the list’s current scroll position by the same amount. Depending on what controls you have in your scrolling list, you may find that the one that is being touched for the drag highlights, and stays highlighted after the player lets go. The solution is either to use a control that doesn’t behave that way (e.g. a Label instead of a Button) or to change the GUIStyle/GUISkin to make selected controls look the same as unselected. Things can get a little trickier for detecting single-taps on a control in the list. It’s tempting to keep the standard GUI click detection code in place. That can be used in some cases, but not if we want the behavior that I described above, where the row is highlighted when the touch begins, and can turn into a selection or a drag depending on if the finger moves or not. UnityGUI y-coordinates are inverted when compared to touch coordinates. Touch coordinates need to be adjusted by the amount that the list has been scrolled. UnityGUI windows and scrollframes also add offsets to the coordinates. // Was it a tap, or a drag-release? When the user drags and then lets go a standard iOS scrolling list, it doesn’t stop moving immediately. We want that same effect of drifting to a stop. I do this by calculating an initial velocity when the touch ends. This moves the list for half a second, or until a new touch begins. When the code detects that the touch has ended (TouchPhase.Ended) it stores the y-component of last touch’s deltaPosition. Dividing this by the deltaTime gives the starting velocity, which is gradually reduced to zero over the next half-second. This doesn’t have exactly the same feel that iOS lists have, but it’s very close. Here is the code that sets up the inertia when the touch phase has just ended. It stores the time of the release and how fast the list was being scrolled at the time. Here is the code that runs when there are no touches (or multiple touches, which I chose to ignore.) If the list has some leftover velocity from the last drag, it moves the list for a while longer. This uses the variables that were stored by the previous code sample. Testing reveals that the list works well now. But there is a question of what to do with the original scrollbar. Dragging on it is a bit weird because it moves in the opposite direction as the list. In other words, you drag the list up to move down, but you drag the scrollbar up to move up. 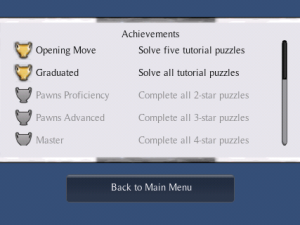 For Pawns I simply made the scrollbar very narrow to discourage tapping on it, but it remains as a visual cue that this is a scrollable list. However, note that this code still runs in Unity Remote, which can lead to cases where a touch is interpreted both as touch and as a click. One last optimization: we can reduce the number of drawcalls a lot by only drawing rows that are actually visible- a trick I blogged about earlier. Important: If you are developing for Android please note that the touch events apparently work a little differently, which breaks the inertia. Please see the comments below from Ali, Greg, and Roberto for ways to fix it. My thanks to them! (7/4/2013) I have added code to section 2 for detecting whether the touch is inside the scrolling list or not. Thanks for reporting that bug, everyone! This code has also been tested with Unity 4 now and it works without modification. This entry was posted in Blog Topics, Unity3d and tagged ios, iPad, iPhone, touch, Unity3d, unitygui on September 6, 2010 by Matt.